The No. 5 Trabuco Hills Mustangs (1-0) opened their season on Friday by hosting the Brighton, Utah Bengals. Fresh off their 12-7 victory over the Mater Dei Monarchs on Thursday, the Bengals came to Mustang Way as a bit of an unknown. 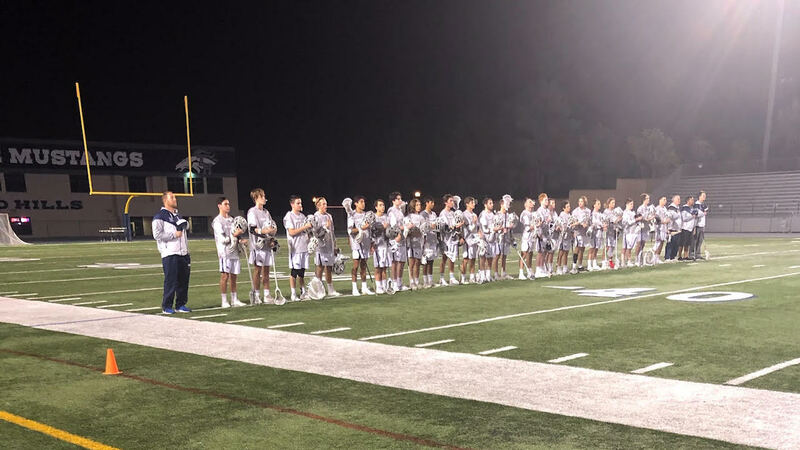 However, Trabuco Hills proved to be too much for Brighton, coming away with a 16-9 victory in a game that was never really in doubt The game started out slowly with both teams trading goals in the opening minutes. Trabuco Hills faceoff specialist Colin Seedorf (Colorado Mesa commit) set the tone early that he was in full control of the faceoff X. Seedorf faced a number of different options from Brighton and came away with well over a 75% win percentage for the night. The first quarter ended with Trabuco Hills holding a 2-1 advantage on the scoreboard. The second quarter proved to be decisive with the Mustangs outscored Brighton 9-1 in the quarter. The Bengals were not able to mount a challenge after that knockdown blow. The Mustangs were paced by reigning South Coast League player of the year Holden Evans (Colorado Mesa) who stole the show for the Mustangs with 1 goal and 7 assists. AJ Switzer (Colorado Mesa; 4 goals, 1 assist), Josh Burdette (4 goals, 1 assist) and Jared Friesen (Ohio Wesleyan; 4 goals) also had big nights. Seedorf, Miles Santos, and Luke Davis rounded out the Mustangs’ scoring with one goals apiece. Davis’ goal, his first as a varsity player, came off a beautiful feed from returning team captain Justin Paget. Paget’s assist was just one of the many contributions. 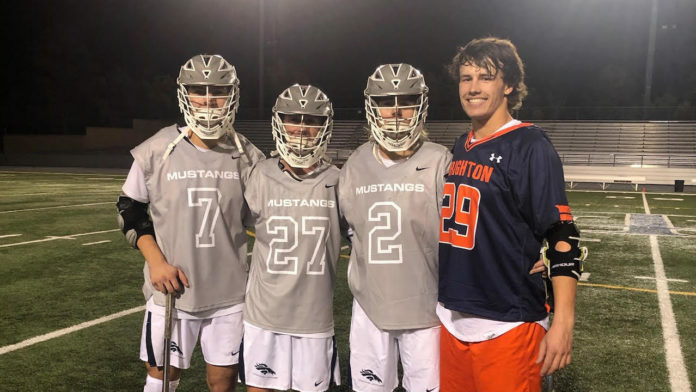 Operating from the obscurity of the short-stick defensive middie position, Paget’s stellar performances on defense and in the clearing game have become customary to the Mustangs. Although many of his contributions do not show up on a stat sheet, Paget always seems to find a way to impact a game. While the Mustangs high powered offense was on display all night, they also received outstanding defensive efforts from long poles Max Wulterin, Hunter Teston and Logan Angel. They stymied Brighton throughout the night and caused several turnovers between the three of them. Sophomore Cooper Gatine was rock solid between the pipes with nine saves on the night, several that were from point blank range. Brighton was paced on offense by attackmen Blake Yates (3 goals), Josh Nelson (2 goals) and Josh Nydegger (2 goals). Goalie Canyon Curtis rebounded from an early injury to make several highlight reel saves. Brighton returns to action in the annual tour of Orange County Saturday for a noon faceoff against the Servite Friars. Trabuco Hills makes the short trip across Rancho Santa Margarita to face the Santa Margarita Eagles in a battle of top 5 teams on Monday at 5:30pm. Both teams will be looking for an early season statement win in what should be a hotly contested affair.